Harrogate Railway Athletic will entertain Athersley Recreation in their first league game of the upcoming 2017/18 season. 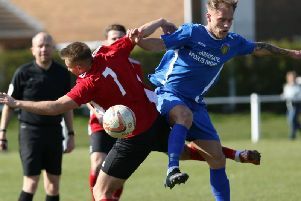 The NCEL Premier Division fixtures were released this week and Liam Gray’s new-look side will host the Barnsley-based outfit on Wednesday August 9 before travelling to Thackley four days later. “It’s nice to be at home first game of the season,” Gray reflected. “We’ll aim to get all of our junior sides down on the day and encourage all our fans to come and support us and hopefully end up with a big crowd behind us. “We started our pre-season late, so we’re probably six weeks behind everyone else in terms of our preparation for the new campaign, so it might take us a couple of league games before we are where we need to be. Railway face a festive double-header with Rainworth Miners Welfare, visiting the Mansfield side two days before Christmas on December 23 and then hosting them at Station View a week later on December 30. Gray’s troops are then scheduled to round off the campaign with a home clash with Garforth Town on April 28.